If you are passionate about digital innovations, looking for inspiration, enjoy listening to motivational speeches and want to feel the vibes of the buzzing brains of unstoppable creators – this is the right place to be for those two days! For the 5th time in Montenegro spark.me assembles a wide international community to discuss the recent trends in the digital marketing world and internet. In addition to the speakers, young entrepreneurs are offered the chance to compete for the life-changing prize – TechCrunch Disrupt San Francisco 2017 Startup Alley, from 18 – 20 September 2017 and 10-day paid accommodation for two entrepreneurs at the Startup Embassy residence located in Palo Alto, Silicon Valley, sponsored by Startup Embassy. The participants will get the chance to present their projects and ideas in front of those people who have achieved epic heights throughout their careers. This year in spark.me the following 9 prominent speakers, from all over the world, who are true experts in their fields, are going to share their thoughts with you. There will be no shortage of action! This is the unique opportunity to hear from and connect with the leaders of the internet and digital innovators. An Indian social entrepreneur included in the Forbes “30 Under 30” global list (in 2016), and in The Rockefeller Foundation Centennial List of “100 Next Century Innovators”. Sharad is the founder and CEO of Dexterity Global, an internationally awarded social enterprise which creates and leverages online and offline platforms for high school students to democratize access to information, opportunities, resources, and platforms. Dexterity Global impacts over 1.2 million children annually in India and other parts of South Asia through its ecosystem of educational platforms. 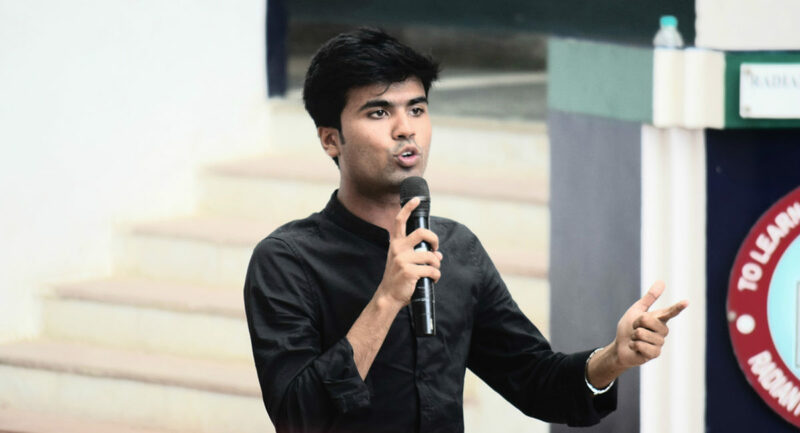 Recognized for innovation in democratizing education and building sustainable impact enterprises, Sharad remains the highest ranked Indian on the list of “World’s 100 Most Powerful Young Entrepreneurs”. Sharad is a widely followed youth icon with over 130,000 followers on his social media accounts, and is quoted globally by influential leaders, corporates, universities, newspapers and media houses. A tech entrepreneur, and the author of internationally acclaimed book, „The Mom Test“. Often cited as a must-read book for all entrepreneurs, „The Mom Test“ is a practical guide to customer development and early-stage sales. „The Mom Test“ has been used in some of the top global universities, including University College London, Imperial College London, Harvard, and Oxford, and is used as a key tool at numerous startup accelerators across EU. As a serial tech entrepreneur, Rob is the founder of a number of bootstrapped and funded companies in the US and UK. He has built products used globally by brands like MTV & Sony. Rob is an alumnus of Y Combinator, a prestigious American startup accelerator, considered „the world’s most powerful start-up incubator“ (Fast Company) and „a spawning ground for emerging tech giants“ (Fortune). Vice Chairman of Ogilvy & Mather UK, a global advertising and marketing agency based in London. Rory joined Ogilvy in 1988 as a graduate trainee. He spent 20 years working as a copywriter and creative director before co-founding #ogilvychange, the specialist behavioural economics practice within the Ogilvy group. Aside from serving as a Vice Chairman to one of the greatest advertising and marketing agencies in the world that works with clients like Unilever, Dove, and American Express, Rory co-heads a team of psychology graduates who look for “butterfly effects” in consumer behavior as part of #ogilvychange. The department looks for very small contextual changes which can have enormous effects on the decisions people make. For instance, tripling the sales rate of a call centre by adding just a few sentences to the script. Put another way, #ogilvychange looks for those unexpected (and inexpensive) nudges that transform the way that people think and act. During his career, Rory has variously been President of the Institute of Practitioners in Advertising, widely recognised as the world’s most influential professional body for practitioners in advertising and marketing communications, Chair of the Judges for the Direct Jury at Cannes Lions, a global event for those working in the creative communications, advertising, and related fields, and has spoken at TED Global. It is worth noting that his TEDGlobal 2009 talk has 2.8 million views. Rory also writes regular columns for the Spectator, Market Leader and Impact, and also occasional pieces for Wired. An award-winning keynote speaker, content strategist and copywriter based in London. Jon is the founder of marketing consultancy TBC Global Ltd, where he works with brands and agencies to help them find truly unique ways to earn and keep the attention of their consumers. He is the co-author of several internationally aclaimed books on advertising and marketing: „Newsjacking: The Urgent Genius of Real-time Advertising“, „Hacker Maker Teacher Thief“, and „Truly Ballsy Content“. A seasoned keynote speaker, Jon gave talks at some of the biggest marketing conferences in the world. He is one of the few people who have been speakers for seven years in a row at South By Southwest Interactive (SXSWi), the world’s largest tech and marketing conference. Jon now serves on SXSWi Programming Committee. He also leads the content strategy committee of SEAT (Sports and Entertainment Alliance in Technology), the largest gathering of marketing and tech directors for pro sports teams, and brings the content fun factor to Cannes Lions, a global event for those working in the creative communications, advertising, and related fields. A student of brands and realtime response since the early days of Twitter, Jon co-founded Urgent Genius, the world’s first blog dedicated to reactive creativity, in 2010. His work has been cited by Rolling Stone, Fast Company and The Guardian. A pioneer of multi-platform storytelling and multiple winner of the highest-profile awards in advertising and marketing industry. Jason is former Worldwide Executive Creative Director at Saatchi & Saatchi, global communications and advertising agency known for its outstandingly creative ideas. During his time at Saatchi & Saatchi, Jason led the output for brand giants like Deutsche Telekom, Toyota and Glaxo-Smith Kline. Jason has been distinguished with various Grand Prix, Gold, Silver and Bronze awards at Cannes Lions (global event for those working in the creative communications, advertising, and related fields), Eurobest (pre-eminent festival and awards celebrating the best of European creativity), LIA (London International Awards, honoring pioneers, and embodiments of excellence in advertising, digital media, production, design, and branded entertainment), ADCE, ADC, CCA, ADCI, Golden Drum, Epica, Clio, and many other shows around the world. In 2015 alone he won an impressive 9 Cannes Lions for Vangardist Magazine and it’s “The HIV+ Issue” printed with ink containing HIV-positive blood, in an effort reignite the conversation about the disease. In 2016 he was further awarded another 10 Lions by Cannes Lions mostly for his work on Sea Hero Quest, the world’s first mobile game where anyone can help scientists fight dementia. The mobile game has been downloaded over 2.3 million times and players have revolutionized research by contributing over 7,500 years-worth of data. In 2016 he proudly took on the role of Global Executive Creative Director at Serviceplan Group, partnering with Alex Schill on a mission to grow the company into the world’s number one independent agency group. The most popular “mommy blogger” in the world and a New York Times bestselling author. Heather is a pioneer in the world of online advertising. In the 17 years that she has been shaping the Internet writing community, she’s worked to create targeted content for numerous global brands including Ford, Nintendo, and Clorox. Heather has twice been invited to the White House to consult in an official Forum on Workplace Flexibility and is a highly sought after speaker on topics that span social media, philanthropy, activism, and the ever elusive work-life balance. Because of her work and impact, she was named by Forbes Magazine as one of the 30 most influential women in media. CEO of consulting company Ginicanbreathe, and #1 rated female Snapchat business influencer in the world. Virginia is the founder and CEO of Ginicanbreathe, a PR, social media, and influencer marketing firm that helps businesses build influence and online awareness. She has been named the #1 Female Snapchat Business Influencer in the world, by Inc. Magazine. She’s partnered with organizations like BBC, Nasdaq, Sundance, and Good Mag to promote their content and hook users onto their products. Virginia is a trilingual nomad who has been to 15 different schools and traveled all around the world. After a five-year career in the corporate world, where she managed over a billion dollars at Apple and Oracle without a degree, Virginia decided to start from scratch, to build an online following, and to devote her life to the research and spreading of happiness. Today, she is a Snapchat celebrity with a global following who’s made Snapchatting her full-time job. A serial entrepreneur and one of the most influential interface designers in the world. Named the „Master of Design“ and one of the Top 40 influential designers by Fast Company, Aza is currently a founder at a tech company called Other Inc. Previously he worked as VP at Jawbone, which acquired Massive Health, a consumer health company he cofounded in 2011 with the goal of helping people take control of their health through good information design. His entrepreneurial path started with Humanized, known for its innovative work on creating more intuitive user interfaces. The five-person startup was soon acquired by Mozilla, and Aza started helping to build the web as we know it. He worked as Head of User Experience at Mozilla Labs and Creative Lead for the Firefox browser. He also founded two other companies, a music meta-search tool Songza.com (acquired by Google) and Bloxes, company that sells furniture made out of cardboard which are used everywhere from Google to Twitter. Aza is considered „the guy behind a lot of the coolest stuff on the internet, from our browsers to our music, to our health tech toys“ (Business Insider). He was named to Inc 30 Under 30 in 2011, and to Forbes 30 Under 30 in 2012. Aza gave his first talk on user interface at age 10 at the local San Francisco chapter of SIGCHI and got hooked. Today he is a TED speaker and a sought-after keynote speaker. In another life, Aza has done Dark Matter research at both Tokyo University and the University of Chicago, where he graduated in math and physics. Privacy advisor, speaker and writer on topics related to digital rights, privacy, civil rights, and the future of technology. Ancilla began her career of a digital rights and privacy issues activist and spokesperson as an intern in the leading Dutch digital rights organization – Bits of Freedom. In June 2016, Ancilla was elected as the top candidate of the Pirate Party of the Netherlands for the Dutch parliamentary elections in 2017. Her priorities were aimed at strengthening privacy rights and opposing abolishing cash, warning about the future where a person would be followed on the basis of their payment history. In April 2017, Ancilla announced she would be leaving the Pirate Party as front-runner, choosing the role of a passive member and an advisor to future party members. Ancilla keeps advocating for digital rights, privacy and civil rights by wiriting for popular Dutch media such as the New Revue, The Next Web, De Volkskrant, on Joop.nl and in Financieel Dagblad, and speaking at the biggest technology conferences across the world. A best-selling author, trainer in the field of strategy, and a behavioral psychologist. Dr. McEwan is considered an expert in the fields of innovation strategy, leadership and organizational culture, and his works have been translated into more than 13 languages. Is the author of six internationally award-winning books, including “The Strategy Book,” “The Innovation Book” and “Adaptability: The Art of Winning in an Age of Uncertainty”. Dr. McEwan is a member of the British Psychological Society and a member of the Royal Scientific Association (Royal Society of Arts), the association based in London, which aims to find practical solutions to social problems. Dr McEwan works as a trainer in the field of strategy for some of the most successful companies in the world that are on the Fortune 100 list, and as an advisor to leaders from a wide variety of industries, from retail and manufacturing to pharmaceutical the industry and the police, to public companies and luxury hotels . Their knowledge is shared and the main speaker at conferences around the world. Event is set for May 29-30, in the seaside resort of Budva, Montenegro. spark.me records: The mission of Spark.me Startup Competition is to bring together successful startups from all over Europe, help them grow, and share their ideas with the world. Previous winners of Spark.me Startup Competition are TruckTrack (2013), FishingBooker (2014), COPRIX media (2015), and dryTools (2016). All startups founded after September 1, 2015, and those that have received less than $2.5 million in funding, are eligible to apply, regardless of where they are registered. This is necessary in order to be eligible for the TechCrunch Disrupt SF 2017 Startup Alley.